LANDFIRE (LF) would like to acknowledge and thank everyone who has contributed data. 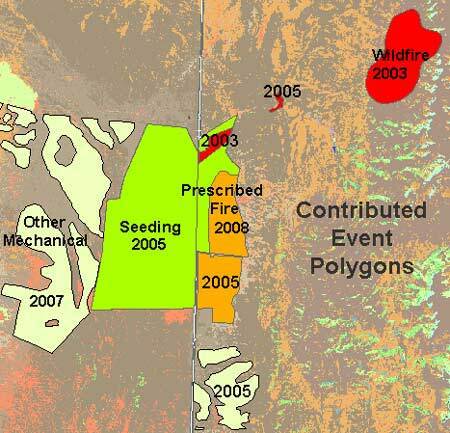 Disturbance and treatment polygons are processed and maintained in an events geodatabase. The LF Events Geodatabase is used to inform updates to existing vegetation and fuel layers. LF primary focus for this data call is to collect disturbance and treatment polygons from 2017 and 2018 to be evaluated for use in the next update. If you submit more recent or older data, LF will archive the data for evaluation and potential use in future mapping updates or comprehensive remaps. Refer to Disturbance Data Processing to learn how LF evaluates and processes polygon data. We will accept data in various formats, including ESRI shapefiles, geodatabases, and ArcInfo coverages. Supporting information, including definitions of the fields and any codes in the data tables, should accompany the data to ensure correct interpretation. LF Events Geodatabase Data Dictionary shows the attributes that LF archives from disturbance and treatment data contributions. LF Reference Data Requirements provides more information on LF disturbance and treatment polygon data needs. See an overview depicting LF 2014, 2012, 2010, and 2008 reference statistics.